SCIENTISTS have put paid to another old wives tale, that buried whale carcases on the beach attract sharks closer into the shore. Southern Cross University researchers found that decomposition plumes from whales remain close to a burial site and therefore the practice of burying whales at the beach would be a safe option - when done correctly. Lead researcher James Tucker, a PhD candidate at the University's National Marine Science Centre in Coffs Harbour NSW, said the study was important and timely. "With the recovery of whale populations along Australia's coastlines, the frequency of carcasses being stranded on beaches is growing," he said. 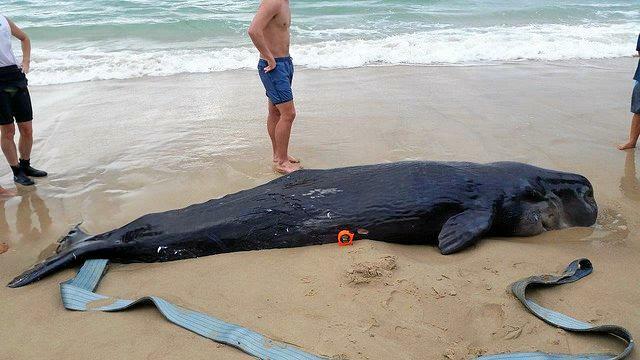 "Beach burial has long been a common method to dispose whale carcasses. Communities, however, fear this practice attracts shark because the leachate travels with groundwater towards the ocean. "Our first study implies those concerns may be unfounded, helping authorities in their carcass management." The world-first project was funded by Southern Cross University, NSW Department of Primary Industries, and Sea World Research and Rescue Foundation. The project involved two experiments, one at the beach and the other in the laboratory, which mapped the decomposition products from a beach burial, as well as the time taken for plumes to disappear. "Our experiments showed that provided certain conditions are met, those decomposition plumes are unlikely to reach the ocean where they could be sensed by sharks," Mr Tucker said. "Both field and laboratory experiments revealed groundwater is very effective at downgrading the whale decomposition products." Mr Tucker said the key recommendation in choosing a burial site was to ensure minimal levels of groundwater movement. "We recommenced authorities select a site where there is no water or limited water passing through. And to account for any high tides, the carcass needs to be buried as far as possible from the ocean." The study Whale carcass leachate plumes in beach groundwater: A potential shark attractant to the surf? was published in Marine Pollution Bulletin. His first paper was published last year Whale carcass strandings on beaches: Management challenges, research needs, and examples from Australia in the journal Ocean and Coastal Management.